Uglyworld #877 - Insight Into A Turtle's Mind (331-365), originally uploaded by www.bazpics.com. There's no point denying it, I and everyone else knows that there's been many a night where you find yourself lying in bed unable to drift off to sleep and asking yourself the question, "What exactly do Turtles think and talk about all day". Thanks to the wonders of a hidden Uglycam(TM) which Wage found on Uglybay recently we were able to find out the answer to that question once and for all. Tim and Tam had been wandering off most days to a quiet corner of the room which was painted green on one wall and a pale hint of yellow on the other, so Wage placed the Uglycam(TM) behind a notepad and pen which lay on the desktop nearby in the hope we would catch a completely unscripted conversation between the two Turtles. 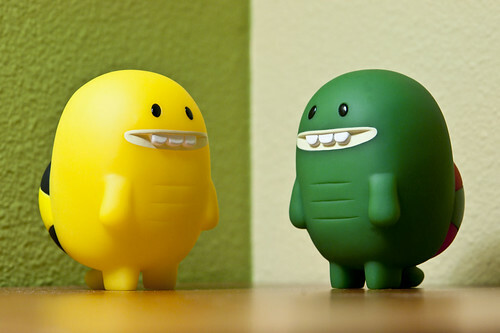 It didn't take long before the hidden camera started producing the goods, as it caught the pair arguing over whether "yellows" or "greens" is the best colour, so much so that they decided to swap positions and stand against the opposite colour of the wall for a while to see how it felt. It was hard for Wage to keep his laughs stifled as he listened in to their conversation, to which he added, "Ha ha's, Turtles is so simples, and everyone knows Oranges is the bestest colour!!!"